It was a bit odd on Monday; apparently most knitters in this week’s jury pool used the Kellogg Blvd entrance and had their knitting confiscated by security. I used the 4th St entrance and had no trouble. The Jury Supervisor was awesome! He went to the security station and picked up the yarn and needles and returned them to their owners. It’s also my first time inside the Ramsey County Courthouse. I never realized (it’s so different looking at a building’s exterior up close and personal than from afar) that it contains fabulous Art Deco features. Even the tiniest detail, like the women’s restroom door handle, is gorgeous. 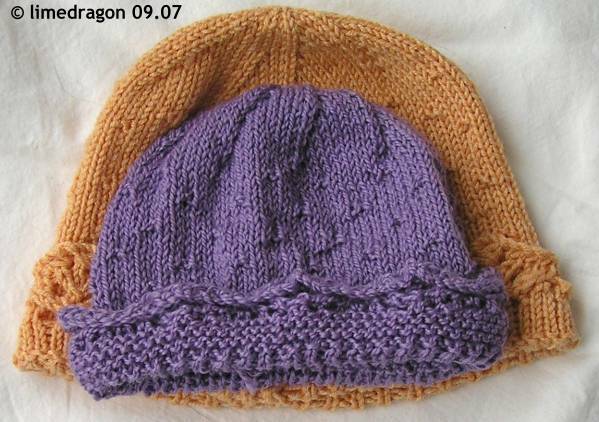 More knitting�more baby items in my favorite color! You aren’t seeing double. 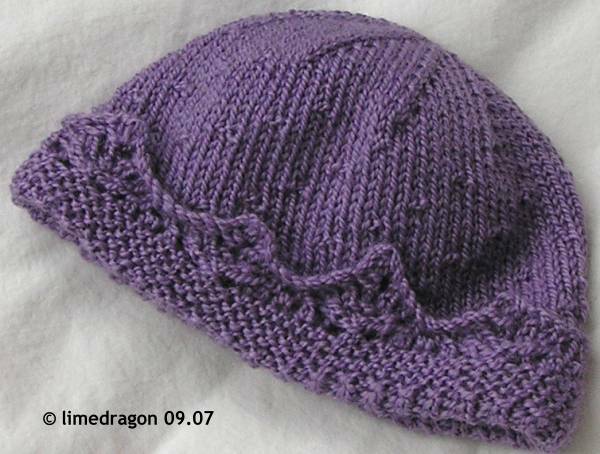 I knit the same hat and booties again, this time in a lovely purple. These are for another Rachel (with only one L this time), who happens to be my cousin. She was expecting a girl in October; naturally I wanted to knit a few things for them. I picked up some Louet Gems, and had trouble with the gauge for the hat. As you can see, it turned out smaller than the Panda Wool version. Eeep! It blocked out well, but might not fit for a very long while. This time around, I got the garter stitch border on the lace edging correct. It looks much nicer! These really are cute! I see what you mean by the garter stitch detail. Arbritary and inconsistent security really chap my hide. That is a reaaly great baby pattern! I love both versions. I love the purple edition. The booties are total cute overload. I’m so glad you can knit during the jury duty process. It’s unbelievably tedious without something to do. Very cute! And very encouraging about being able to knit… will keep it in mind for myself for Nov.
Oh those are so very cute!!! I couldn’t knit during my one whole day when I was up for Jury Duty so I fidgeted like a crack addict instead. Glad to hear that the judicial system is wising up to the knitting thing! Hope its that way in my area should I be called upon. Yay for knitting being allowed at least sometimes now. I know a lot of people have been very upset about that issue in the past. Hopefully eventually all courts will allow it. That purple LG is gorgeous! Such a pretty hat and booties set. so glad you made it in with your knitting supplies – and how nice of the jury supervisor to get the yarn and needles for the other jurors. Those booties (and hat) are so adorable. I must be missing it. Did you mention which pattern this was? Or what publication?